Watanuki Ltd. / Toki-no-Wasuremono is presenting Yusuke KOSHIMA Exhibition for the third time since 2 years ago. Returning to Japan after working at the architect studio in Berlin, KOSHIMA established his own studio in 2008. He made a succesful debut in 2011 with his maiden work "Gaifu-kan", the home and the aikido training hall for Tatsuru UCHIDA (philosopher and martial artist) and also being selected at SD Reveiw 2011. Since then, as well as working as an architect, he has been broadening his field of activities such as a MC for "J-Architect", a TV program on NHK WORLD which introduces Japan's representative architects to the world and designing concert stage background for a rock band ASIAN KUN-FU GENERATION. KOSHIMA has been constantly presenting a drawing works with imaginary cityscapes titled "Urban Lanscape Fantasia". 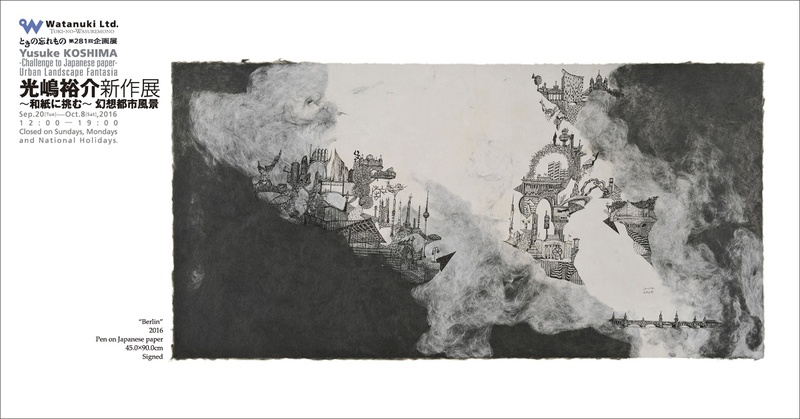 In this exhibition, we are exhibiting 10 large size monochrome works drawn on Japanese papers which KOSHIMA made himself. As a new challenge, KOSHIMA has integrated major cityscapes such as Berlin and New York to his imaginary landscapes in his new works. Registered architect. Born 1979 in New Jersey, USA. Returned to Japan in 1987 and since then, grew up in Canada (Tronto), England (Manchester) and Tokyo. Graduated from Waseda University in 2004. In the same year started architect career at Sauerbruch Hutton Architekten, the architect studio in Berlin. In 2008, he returned to Japan and established Yusuke Koshima Architecture Studio. Inaugurated as a part-time lecturer at Kuwasawa Design School in 2010, and at Nihon University Junior College in 2011.